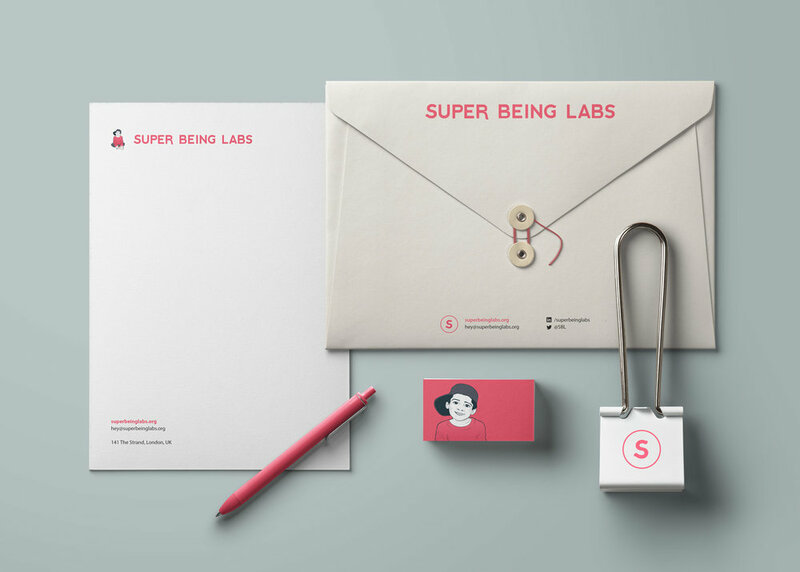 Brand identity for Super Being Labs; the agency who looks to create social impact using entrepreneurship, creativity and technology. The logo mark and branding explored themes of play and was inspired by their aim to be imaginative, adventurous and curious - as we were as children. Being that Super Being Labs' portfolio tackles often serious or sensitive issues, it was important to use a type which was grounded, humble and honest as a base. From here we could use that to evoke the agencies key attributes; youthfulness, play and imagination. Rounding the corners softened the type and made it more approachable while the flicks at the end of selected characters look to mimic that of a super heroes cape. A red was selected as something found between the powerful or driven and the jovial or youthful, but firmly grounded in the exciting. The softness of the tone gave it an approachability yet earnestness.